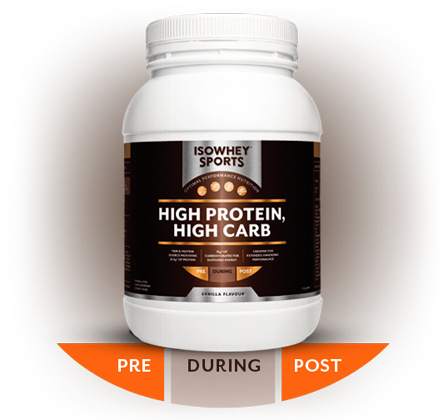 More than 21g* of protein per serve for support of muscle structure and growth. 14g* (chocolate) and 16g* (vanilla) of carbohydrates for sustained energy. Carbohydrate sourced from waxy maize starch, which contains a large amount of branched starch called amylopectin that helps restore muscle energy reserves. High dose of amino acids that contribute to optimal muscle growth. Mix 1 serve (1 serve =50g) into 200mL of water, milk, or milk substitute. Consume once daily. INGREDIENTS: Whey protein concentrate (45.7%), maltodextrin, sweeteners (xylitol, steviol glycosides), maize starch (5%), whey protein isolate (3%), calcium caseinate (3%), creatine monohydrate, vitamin and mineral blend (calcium carbonate, magnesium oxide, ascorbic acid [vitamin C], dl-alpha-tocopheryl acetate [vitamin E], ferrous fumarate [iron], nicotinamide [vitamin B3], zinc oxide, manganese sulfate, pyridoxine hydrochloride [vitamin B6], cyanocobalamin [vitamin B12], d-calcium pantothenate [vitamin B5], riboflavin [vitamin B2], retinyl acetate [vitamin A], thiamin hydrochloride [vitamin B1], copper gluconate, sodium molybdate [molybdenum], selenomethionine [selenium], potassium iodate [iodine], cholecalciferol [vitamin D3], chromium nicotinate, folic acid, biotin), natural flavours, L-glutamine, sunflower or soy lecithin, enzymes, Lactobacillus acidophilus, Bifidobacterium lactis. WARNINGS: Contains milk and soy products. Contains xylitol: Excess consumption may have a laxative effect. Phenylketonurics: Contains phenylalanine. Not to be used as a sole source of nutrition. Should be used in conjunction with a balanced diet and appropriate exercise program. Not suitable for children under 15 years of age or pregnant women. Should only be used under medical or dietetic supervision.